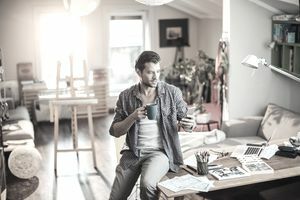 Can you collect unemployment if you are working as a freelancer, independent contractor, or self-employed individual running your own business? It’s worth looking into, as you may be eligible depending on your circumstances. In most cases, self-employed workers, independent contractors, and freelance workers who lose their income are not eligible for unemployment benefits. Because employers contribute to a fund for unemployment benefits, their employees are eligible to receive benefits from the government, if they qualify after losing their job. If you are operating as self-employed, you most likely didn't pay into your state's unemployment fund. If you were paid as an independent contractor and receive a 1099 form, you were not considered an employee and would not be eligible for unemployment. That's because eligibility for unemployment is based upon being employed by an organization that was paying into the unemployment insurance fund. There are some circumstances where self-employed workers may be able to collect benefits, however. If your business is incorporated and pays into unemployment, you may be eligible to collect unemployment benefits. If you were unemployed as a result of a major disaster, you may be eligible to receive Disaster Unemployment Assistance. The federally funded DUA is designed to provide assistance to workers who become unemployed as the result of a Presidentially declared major disaster, and who are ineligible for other unemployment benefits. State unemployment law may provide for eligibility for benefits in some other special circumstances, and your unemployment department can help you navigate the process should you become unemployed. Eligibility varies from state to state, so if you're not sure whether you're eligible, check with your state unemployment office to find information about who can collect unemployment compensation, and how to go about filing a claim. When you become unemployed, it’s a good idea to check if you may be eligible for benefits right away. It can take time to begin receiving benefits if you do qualify, so you should file your claim as soon as possible. The Self-Employment Assistance Program is a federal government endorsed program which offers unemployed or displaced workers in some states unemployment benefits when they are starting a business. The Self-Employment Assistance program pays a displaced worker an allowance, instead of regular unemployment insurance benefits, to help keep them afloat while they are establishing a business and becoming self-employed. If you are collecting unemployment based on a job you had, working freelance can impact the benefits you are receiving. For example, in New York state, you need to report income when you do freelance work, do "favors" for another business, start a business, or are or become self-employed while you are collecting unemployment benefits. If you are doing other work you may become disqualified from receiving unemployment benefits. There are similar requirements in other states. In addition, in order to claim benefits, you need to be ready, willing and available for work. Some states require that you keep and regularly turn in an employment log documenting your efforts to regain employment. If you are receiving unemployment benefits, make sure that you know the guidelines regarding any work you engage in. Violating the requirements can result in a loss of benefits and also substantial fines if you are discovered. Do I Qualify for State Unemployment Benefits? How Much Will My Unemployment Check Be? Do I Qualify for Unemployment When Collecting Social Security? Can You Collect Unemployment When You Quit Your Job? Can You Collect Unemployment If You Work Part-Time? What Can Disqualify You From Receiving Unemployment Benefits? How Does Severance and Vacation Pay Affect Unemployment? What Happens if an Employer Contests Unemployment Benefits?